Roll out a block of puff pastry to a thickness of 5mm/¼in. With a pastry cutter, cut out the vol-au-vents to the size you want. Remove the excess pastry. This can be rerolled to make more vol-au-vents. With a slightly smaller pastry cutter, press halfway down into the pastry circle, taking care not to cut through the bottom. Brush a little beaten egg mixed with a pinch of salt over the top of the cases, making sure not to cover the sides. This would prevent the pastry from rising up evenly. Bake in the oven at 200C/400F/Gas 6 for 10-12 minutes, or until risen and golden-brown. When ready, remove the cases from the oven and allow them to cool. 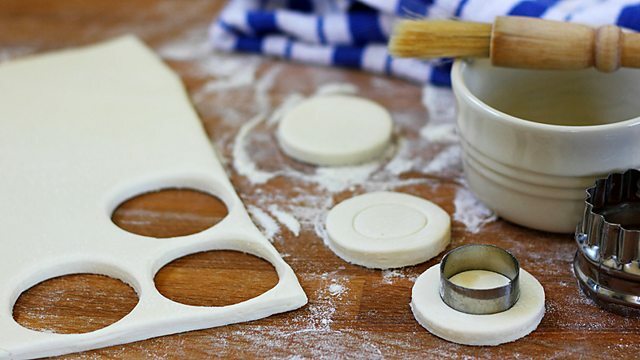 Using a knife, dig out any raw pastry from the centre of the case and discard. Return the cases to the oven for a further 4-5 minutes to dry slightly. Fill the cases with a filling such as spinach and ricotta for a delicious canapé.